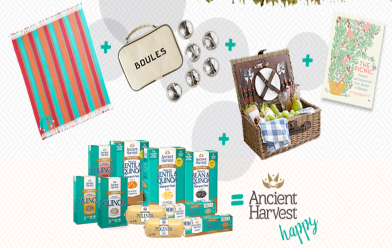 Ancient Harvest Ultimate Picnic Pack Sweepstakes – Win a Pottery Barn picnic basket & more! Win a Pottery Barn picnic basket, a bocce ball set, a pack of Ancient Harvest products & more! ENTER SWEEPSTAKES HERE – Ancient Harvest Sweepstakes page. ELIGIBILITY – The Ancient Harvest Promotion is open to all legal residents of the U.S. who are at least eighteen (18) years of age as of contest start date. SWEEPSTAKES ENTRY PERIOD – The Promotion will begin at 1 AM Mountain Standard Time (“MST”) on June 1, 2016 and end at 11:59 PM MST on June 30, 2016. PRIZES – One (1) Standard Prize will be given, consisting of a picnic basket, picnic blanket, bocce ball set, The Picnic book, and a pack of Ancient Harvest products or coupon of equal value; for a total value of $150.